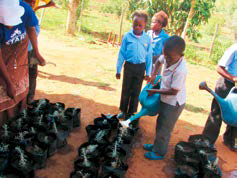 Small children in lower grades joining in vegetable gardening. By teaching the community home-gardening, JVC aims to improve food security for the vulnerable including PLWHAs. JVC had been prevented from entering its own project areas in Tshirunzanani; namely four areas in one village, for four months, because some residents engaged in a large-scale strike. However, as access into and out of the village was also strictly restricted for residents, their home vegetable gardens became an effective means for food security, and all the participants in JVC’s training sessions continued their vegetable gardening. After the strike ended, JVC organized training sessions in order to cultivate residents, in their 20-30’s who successfully put their learning into practice, as trainer in the village. In addition, JVC provided trainings to the other residents to ensure that they put what they have learned into practice. The trainees supported each other in spite of their hardships under strike, and there were signs of success in the establishment and sustainability of project achievements. As the evaluation results in 2015 confirmed that the objectives were achieved in the project area with LMCC, JVC conducted monitoring and follow-up once a month. JVC continues to work with LMCC in two villages and carries out projects together with drop-in centers (DICs). These dropin centers cater to children with difficult living conditions due to their family environment, such as orphans and single parented ones. JVC’s activities have improved the support by child care volunteers and the program’s administration at drop-in centers. As a result of the improvements, children regained their confidence and took the initiative in voluntarily supporting care volunteers, starting their own study groups and acting more independently. Therefore, JVC aimed to develop the children’s potential by considering them as not only “people who receive care” but those who acted at their own will for the future. 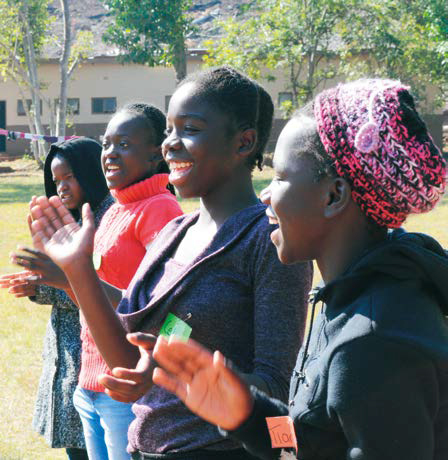 In particular, we arranged teenagers (youth) at the center to participate in local activities, which included raising awareness of HIV prevention, and thinking of their futures and the society they live in. As activities, we organized training sessions for about 30 to 100 youths on HIV/AIDS, sexual behavior, the environment, human rights, leadership, and so on. We also arranged exchange visit with those who were performing similar activities in other areas. By making use of these learning, the youth planned and implemented the awareness raising campaign on HIV prevention twice by themselves, in which a total of about 200 villagers including children attended. 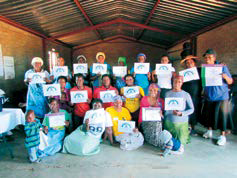 Training sessions were held for adults in villages about how to attend to children, and human rights. Additionally, about 100 youths attended training sessions on gardening in sites of their houses and DICs, with some members even beginning to harvest. The village trainers, whom JVC had trained until the fiscal year of 2015, gave guidance and support to youths in the activities. Additionally, in order to maintain these activities, JVC organized training sessions for 30 board members and care volunteers and 60 guardians in the community on organizational administration, human rights, and caring children. As a result, DICs, schools, and guardians started to collaborate to support children in various ways. Thus, progress has been made to create a local community that supports children.